The Arteriors collection is handcrafted by artisans offering the best in traditional, transitional and casual accessories, accent furniture and lighting decor. 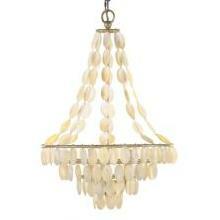 Create a transitional and ethereal look with this natural Shell and painted silver iron chandelier. This chandelier requires three 100W max bulbs. H: 24″; 16″ Dia.